Introduction: One of the problems with which any medieval government had to contend was communications. Messengers were an essential part of the personnel of any medieval ruler. They have not, hitherto, been the object of much study, except for those in the service of the popes and of the kings of England. These, as Renouard has shown, included papal couriers, casual messengers and, above all, messengers attached to the great commercial houses, whose services the curia was able to use without payment, if one could be found going to the right place. The papal administration was prepared to accept some delays in sending letters if it could have them sent free in this fashion. Rarely was a messenger sent with only one message unless it was urgent. Consequently papal messengers who did take only one message tended to go fast and regardless of expense. The papal curia was involved in a more widespread network of contacts than perhaps any other court in Europe. For that very reason it was hardly typical. Royal courts probably tended to organize their posts rather differently. The English court, the only one studied in any detail, had, as at Avignon, a corps of mounted envoys, the so-called king’s messengers, and another of foot messengers, called in the fourteenth century, couriers. In contrast to the popes, the kings of England used these almost exclusively, only very rarely hiring messengers on a casual basis. They regarded these messengers as part of the royal household, paid them regular wages when they were at court and expenses when they were not, and even paid some compensation for sickness. Clearly the section of the English royal household concerned with messengers was fairly well organized. Similarly in France there was a group of horsemen attached to the royal stables and organized under the orders of the grand eel/yer, who took urgent messages. But crowned heads and popes were not the only medieval rulers to have need of a messenger service. Lesser rulers also had to maintain communications with their subjects and with each other. 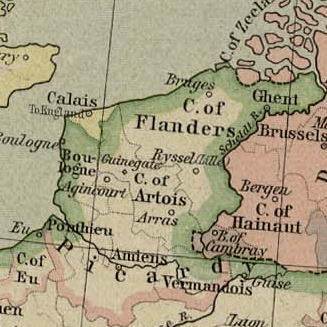 Some idea of how the messenger service of a relatively minor ruler was organized may be obtained from the accounts of the baillis of Artois during the reign of the countess Mahaut.